Each title in the Through My Eyes series reveals a difficult part of the world from a child's point of view. In this latest sub-series, we visit disaster zones. 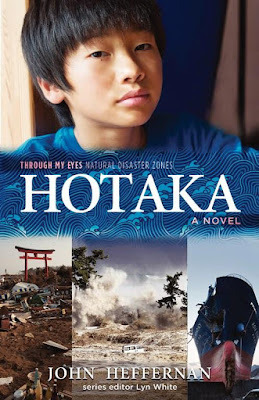 Hotaka is the first to open his heart and share what it felt like to watch his world as it was destroyed in the tsunami that hit Japan in 2011. Hotaka is willing to follow his best friend anywhere, even into danger, but when the two try to rescue a group of elderly people from the swirling tsunami waters, Hotaka's worst nightmare becomes reality. Even three years later, he hasn't fully recovered. John Heffernan explores what it is like to live in a recovering disaster zone and how political addenda can have devastating consequences. With friends who have their own back stories, Hotaka journeys from the stuckness that grief can bring to release and hope in the future, but not without a fight. It is through the highs and lows of his relationships that Hotaka comes to terms with his past and looks forward. It's also through his friends that he learns to fight for what is right even when the consequences are dire. While the dialogue between Hotaka and his elders seems overly formal at times, (in keeping with the traditional Japanese respect for elders), it is when we leave the adults behind that Hotaka's story sings. Hotaka will be a regular go-to in the classroom and a perfect starting point when discussing natural disasters.